Very glad I ordered this. I'm able to read longer at a time. Pillow is weightless. Ordering more for gifts. Great price. This is a really helpful item. We purchased for my elderly mother who likes to read but the 500+page books become too heavy holding after a while. She is very happy with the assistance this item provides. It props up for ease of reading and the tassel bookmark handy also. We bought one for our IPAD and its a big help as well. Sitting in an EZ chair this holds the IPAD at a good angle to view and use. Highly Recommend. I like to read in bed or while reclining and wanted something to prop up my Kindle, Nook and Tablet. The other book pyramids are larger and heavily weighted, making them uncomfortable to rest on your abdomen or knees. This one is lighter, softer and half the price of the heavy ones. I enjoy using mine regularly and will give them as gifts to my bookish friends. This saves my hands and wrists from getting tired and cramped. When I first placed my order, was told this was out of stock but I ordered anyway and to my pleasant surprise, it was delivered just in time for Christmas gift! Thank you! Perfect for my elderly grandmother who just discovered Facebook ! I am a lady who is paralyzed except for two fingers and one thumb.It is always great to find something that makes my life easier.This pyramid reading pillow is one of those things.It will hold both my tablet or a book when I am in bed. I have absolutely no complaints about this product. My sister saw how much I used and enjoyed mine and ordered two. One for my house and one for hers. The price was a bargain as well. Thank you. I use the book pillow for my IPad. Its perfect for books as well. This is great for sitting on your lap while reading an ipad. I purchased this to support our tablets while sitting and watching television. It works just fine for both of them 1 is 10" and the othr is 7". I'm sure it would work great for a book as they are generally lighter than a tablet. I purchased this book to support my cell phone when reading Ebooks. It is 'perfect' whether sitting in a chair or reclining in bed. Doubt the lip would hold back the pages of a new book until the spine would be damaged. Suggest more color selections of fabric. The Pyramid Book Pillow holds my book at the perfect angle for reading at a table or while relaxing in a recliner. Would also work if you read in bed. Wanted something that could hold a book or iPad. This holds my iPad well, it may not hold a larger book since it is about 9 inches wide but generally will make reading more comfortable for me. This pyramid-shaped pillow-stand is one of the most useful items and best purchases I've made all year; I use it every single day! It's sturdy and well-made, yet can be pliable enough when I need it to conform to different size books or devices and positions while reading or playing word games in bed or cozied-up on couch. As I've read in some other reviews, the roll can be too narrow for some larger or thicker books or devices, but this should not interfere with ability to use and enjoy this product as intended. When confronted with such a situation, I simply prop the book or tablet against the pillow-stand without inserting it into or setting it on top of the roll (as pic in Walter Drake shows). A very slick surface could possibly cause the annoyance of some sliding, but in bed or on couch in my lap with my tablet I've had no issue whatsoever; and even with something as thin & lightweight as a mail-order catalog! I also enjoy when my cat wants to play with the tassel, but that could be a hassle for someone else! Good for use with small tablet. Nice idea but slant is not enough to hold the book. Pillow is too small for a medium to large book. The thing is made well enough, the design could use some tweeking. Very disappointed. 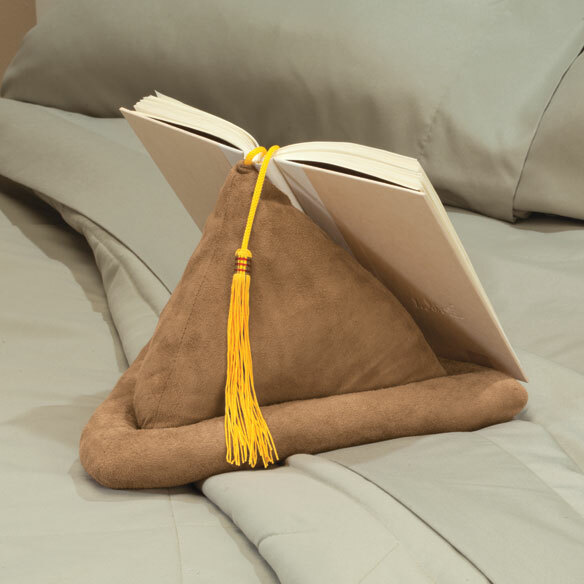 Great idea but the pillow has to small of an edge to hold books. I couldn't even use it for my kindle as it has a case on it. I bought this to use with my Nook, but it is too small to hold the Nook. There is not enough space between the rolled edge and the back rest to work. It would be fine for smaller devices like a smart phone but anything larger not so much. It is cute and well made and I hate that I cannot use it. It seems like this product is too soft and needs to be sturdier. I am disappointed in this product and would not recommend it. I would not buy this product again. I love to read in bed and was looking for a hands free product to hold my book while I am recuperating from surgery. I was really looking forward to this product, but when it arrived, I found it was flimsy, and so small it wouldn't even hold up a small paperback book. Sadly, I had to return the item. It is a great idea if it could be made larger, and sturdier by adding some weight to the product. This product needs to be much larger to be of any use. This was too small on the lap to hold a book on. A person may as well just use two pillows that will actually hold a book!! It is not 12x12x8 inches. More like 10x10x8 and way too small & flimsy to hold a book. The book in the picture must have only been about 7 inches tall! This is a great idea but it doesn't support a small book or an iPad. The roll is too shallow to hold the edge of your reading material. All you can do is lean your book against it. It's very lightweight and doesn't hold an iPad without additional support. I need support in my recliner and only have use of one hand. Should be helpful while reading in recliner or while in bed. I have seen this type of book holder on other sites for quite a bit more money. Will save my poor wrists as I am an avid reader. This is for my disabled son. Hopefully will help while watching/working on iPad, hands free. Medical issues with both hands/unable to hold a book comfortably for more than a few minutes. I read a lot. Price is right. I like to read in bed. My arm tends to go to sleep holding up my tablet. HOPEFULLY, this will allow me to enjoy hands free reading. My Mom wanted it for Mother's Day! I read a lot in bed and this looks like it would be helpful. Used my sisters and loved it. I am having trouble holding books and e readers. I have a tablet that keeps sliding off my lap and I wanted something to keep it in place when I read. It looks like it would be very comfortable to use for a voracious reader! A student in my yoga class mentioned having one and she raved about it. I am buying it for a friend who is in skilled nursing. Saw similar in bookstore but sold out. wanted to be able to use it while in my recliner but not large or sturdy enough. Read about it in the LA Times. Sounds good. I'm looking for a reading pillow for use with my mobile phone. This is the perfect size - not too large as most other choices.